On those frigid days of winter when the wind is high and the temperatures plunge below zero on some nights, I’m sure you feel as sorry for the birds as I do. How do they stay warm in winter? It seems something of a miracle when we see them at our feeders in the morning. The simple answer is that its not at all easy for them, and not every bird will survive sub-zero nighttime temperatures. But, birds do have a range of adaptations and strategies to help them. Most important to warmth is feathers, which are specially adapted to trap warm air. On cold days, we see birds that look as fluffy and round as a little kid dressed up in a down jacket. When fluffed up, those feathers trap a lot of warm air between them. And by regularly preening and applying oil from the oil gland at the top of their tail, they can keep those feathers completely waterproof. Another physiological adaptation is that birds can keep their core temperatures up by circulating warm blood around internal organs, while diverting it from less important peripheral areas. Legs have insulating scales covering them, and if the legs get too cold, birds can tuck one leg up at a time into their feathers and stand on only one leg. Waterfowl have a special type of circulation in their legs in feet. Veins and arteries are located very close to each other in the leg, so warm blood heats up colder blood. Many birds will shiver throughout a cold night. Physiologist David Swanson of the University of South Dakota points out that chickadees may be the toughest of winter survivors. They can’t put on too much weight because they need to be able to fly, but are experts in shivering. These involuntary contractions of opposing muscle groups are very efficient at generating heat. But shivering is costly in terms of calories, so birds need to have had a good feed just before going to sleep. Some birds can even lower their body temperatures significantly on cold nights to conserve calories. This is known as torpor. In extreme conditions chickadees, for example, whose normal body temperature is about 105 degrees, can lower their temperature in torpor by up to fifty degrees. Torpor is risky however, because if faced with a predator, a bird in torpor may have a very slow reaction time . Other strategies to keep warm are behavioral. If they can find a patch of sun, cold birds will turn their back to the sun and raise their feathers so that the sun can heat the skin. At night, many birds huddle with others in shrubs, old nesting holes and nest boxes. Bluebirds, chickadees and others engage in this behavior. Alexander Skutch, in his book Birds Asleep, studied winter wrens’ huddling behavior on cold winter nights. Skutch counted nine wrens in an old thrush nest, ten in a coconut shell and forty-six huddling into a nesting box. One very cold morning, I flushed two mourning doves that were huddling under a drift of snow next to our house foundation. What can we do to help? If you are reading this article, you are probably already doing the most important thing, feeding birds. In winter, it is important to provide high calorie and fat laden foods such as suet, black oil sunflower seed and nuts. A heated birdbath is very much appreciated too. Birds can eat snow for water, but the cold robs their bodies of heat and much needed calories. Remember to fill your feeders before you go to bed so that the birds will have food at first light after the long winter night. That can make all the difference in “your” birds’ survival. It will make for a lovely sight and the satisfying feeling when you are having your breakfast, that you have helped your birds survive the night. Many thanks to all flora and fauna reporters for January. Please send your reports by February 26 to be included in next month’s column. You can call me at 692-3907, write to me at our new address, 7A Old Colony Dr., or e-mail me at mariancharman@verizon.net. Dot Mooney, Monadnock Dr. November 26-30, three male cardinals, six blue jays, cooper’s hawk. December 1, cooper’s hawk, sixteen doves, seven blue jays. Dec. 2, ten blue jays, twenty doves. December 4, four titmice and a few chickadees, gray squirrels. December 10, now 6-7″ of snow and ten juncos, Carolina wren, twenty-four doves. December 12, twelve turkeys, eleven blue jays, thirty-seven doves perched in aspen trees. December 13, hairy woodpecker, downy woodpecker. December 14, forty-nine doves in yard and aspens. December 15, twelve juncos, twenty house sparrows, thirteen blue jays, forty-seven doves. December 16, a flock of twelve cowbirds eating seed. Never seen them at this time of year. December 19, twenty-five doves, twelve blue jays, sixteen juncos, flock of turkeys. December 21, “Winter solstice ushering in our shortest day of the year….I’m already thinking about Spring!” December 22, a light coating of snow. Saw a cooper’s hawk land in aspen tree. 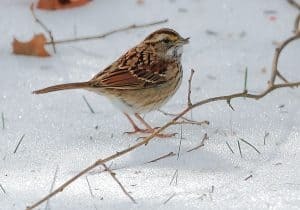 Early evening, at least eighteen juncos and a pair of house sparrows under feeder, at least one tree sparrow with the juncos–first of the season. December 23, a flock of male and female cowbirds eating seed, joined by a few starlings. A number of doves and a few blue jays edged out the blackbirds. Three male cardinals arrived. December 24, cooper’s hawk returned. December 25, thirteen blue jays eating seed with twenty juncos on the ground. December 26, at least seventeen blue jays sitting in trees or on deck for seed–amazing. December 27, flock of turkeys near woods. December 28, three crows in trees, one starling visited suet, a male hairy woodpecker puffed up against the cold. December 29, hairy woodpecker returned for suet. One grackle here later. Three male cardinals joined by two females. Titmouse and white-breasted nuthatch arrived. December 31, eighteen to twenty blue jays on deck, eating sunflower seed–never saw so many. A beautiful full moon rising over back woods. Kathy Cordeiro, Forrest Rd. Pert-looking red fox trotted through the woods behind the house–a first for us. In the past we have seen a bobcat as we were sitting on the deck having dinner. Dot Mooney, Monadnock Dr. January 4, the hard cold continues. Outside my window the rhododendron leaves are pulled in tightly. Cooper’s hawk tried to catch a bird on the deck, but quickly gave up. January 5, storm left us so much snow… Just after sunrise, I watched a porcupine moving slowly and steadily through deep snow in the woods. January 6, sad looking tom turkey around a lot. January 10, little group of five turkey hens eating seed. January 11, lots of deer tracks and piles of droppings in the snow in the back yard. Nice to know they are stopping by. Some of the tracks are of a doe and smaller tracks of her fawn. January 15, immature red-tailed hawk perched in the aspen tree, warming up in the sunlight. Three deer headed into woods on Parkhurst. January 16, three titmice visiting. January 20, one male red-winged blackbird in a flock of cowbirds eating seed. January 21, six cardinals on deck–three male, three female. January 23, ice building up on everything. Debbie Prato, Hayrick Lane. January 1, lots of Canada geese, downy woodpeckers, cardinals. January 5, red-bellied and hairy woodpeckers. January 13, pair of mallards at feeder. January 15, red-tailed hawk and sharp-shinned hawk. January 20, deer eating crabapples off tree. January 24, twenty-five blue jays in maple tree, fifteen juncos. Thirty to forty cowbirds, both male and female. Never have had cowbirds in the winter before. Leslie Thomas, Old Colony Dr. January 6, a red-bellied woodpecker on my deck, right near the slider, pecking at spilled birdseed. Gerry DiBello, Court Rd. January 6, bluebirds showed up today looking very fluffed up and eating both the seeds off the ground and from the feeder. We have been putting sunflower seeds on the ground and making sure heated water is fresh every day. Doug Pederson, Woodland Dr. January 14, one day that was warm this week, I went to the town beach and along the way in were more than fifty mallards all gathered together. Marian and Bill Harman, Old Colony Dr. We put up a thistle seed feeder and the juncos like it–a surprise. Also have titmice, chickadees, white-breasted nuthatch, goldfinch, cardinals, red-bellied woodpecker, downy woodpecker, around six juncos. Hearing crows calling in the woods. Marian Harman is a member of the Westford Conservation Trust, a non-profit conservation organization whose purpose is the preservation of Westford’s open spaces and trails. The Trust welcomes new members and volunteers. Check out our website at westfordconservationtrust.org, or visit us on Facebook.